Nothing quite says spring like a pop of fresh, radiant color. 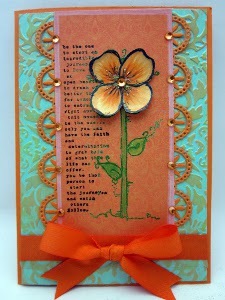 Send a spring greeting to a loved one when you make the Bright Orange Lace Flower Card. This gorgeous spring card uses complementary colors to really make the floral image pop off the page. Handmade card ideas like these are perfect to celebrate the warmer weather because now is when colorful flowers are beginning to grow! Inspire a loved one and give them a touch of spring excitement with this sweet orange card. 1. Cut a 5 x7" card base from WorldWin ColorMates (Deep Orange Dream). 2. Emboss a 4.75" x 6.75" piece of ColorMates Textured Denim (Aqua Denim), using the Spellbinders Decorative Fancy Tags 2 folder. 3. Rub Tsukineko VersaMagic ink (Persimmon) over the raised areas. 4. Cut two borders from the orange cardstock using Memory Box die (Meridian Border). 5. Stamp the word text from Unity Stamp Co.( Bloom and Simplify stamp set), using VersaFine ink onto panel of patterned paper (Webster's Pages). 6. Stamp slightly over the text with the flower from the same set, using VersaMark ink. 7. Heat emboss with a green powder. 8. Use Faber-Castell Gelatos to color in the leaves and stem. 9. Stamp a second flower image on white cardstock , using Memento ink. 10. Color flower with Copic markers and cut out. Apply to card. I have to confess that I am not an orange person...never have been and never will be. The only time I enjoy it is in the fall with pumpkins and such and even then I like it tempered with other colors. So I almost passed this one by but then I looked again and I saw that I can appreciated other design concepts here! Isn't that what hand crafts are all about....inspiration...springboards. I'll change up the color palette to my liking but I really appreciate the time and energy it took to create this card. Thanks for sharing!